Jamie Huang, who is currently 3rd year GHRM MBA student, gladly shares internship experience at Tesla Company, which took place from April 18th to August 31st 2018. Jamie was highly impressed by Tesla company profile and Elon Musk – charismatic and innovative CEO of the company, so when the recruiting post on the website popped up there was zero hesitation about applying for internship. Just in case anyone is not familiar with Tesla, it’s an American company, which mainly sells electric vehicles and energy products. Jamie was a Recruiting Intern at Tesla, Inc. (formerly Tesla Motors, Inc.), so the prior responsibility was to recruit Tesla 2018 summer interns and some entry-level positions for other departments. Most of the time at the company, Jamie was doing resume screening, phone interviewing, and assisting in face-to-face interviews, also a lot of administrative work, which was inevitable in the job, such as creating job vacancy, collecting candidate profile, and filing new hire information on the system. The difficulty during the internship was when Jamie thought there were not enough candidates applying the internship positions, thus Jamie had to try different methods to search potential candidates and find many other ways to attract more people to apply, and surprisingly hundreds of people applied the internship just right before the application deadline, which might be the human nature. The job itself was very interesting and practical, and Jamie had a chance to get in touch with all kinds of candidates everyday and learned how to operate the online HR system, which all brought very valuable hands-on experiences. Besides, the work environment was very encouraging and flexible: the colleagues there were easy-going and willing to share their own experiences. Working in such a fast-paced environment helped Jamie to enhance adaptability and resilience that trained to work in a more systematical way. Jamie explains that the basic three factors from NSYSU GHRM MBA Program helped a lot: the English environment; cross-cultural projects and HR knowledge, obtained during courses. “When you personally encounter the situation, then you will realize the concepts that you learned before.” – says Jamie. Since Tesla is a foreign company, there were a few foreigners in the office and they often communicated in English especially when writing emails. Also, Jamie had to cooperate closely with the HR department in Hong Kong. Jamie 100% recommends other students to enroll in the internship that fits their interests or would like to have a try, especially the kinds of internship that can help know more about the realistic aspects of the job itself. In a human resource consulting company, the clients can be from different industries and fields. Thus, it is important for Jamie and her team to do research about their clients’ industrial background. Researching industries, analyzing resumes are the early preparation of her work, then moving on to phone interviews and narrow down the potential candidates for interviews in order to choose the most suitable talent for their clients. Apart from recruiting, Jamie learned the importance of processing crisis and thinking critically during her internship. “Before asking for definite answers, we have to think according to the logic behind our work and offer our own ideas.” Why do our clients need this talent? What makes to candidate quit his/ her previous job? What are the needs of both ends and how do we meet them? While learning about recruiting skills, thinking about the bigger picture can make one understand the trends of the job market and prepare oneself for the future. 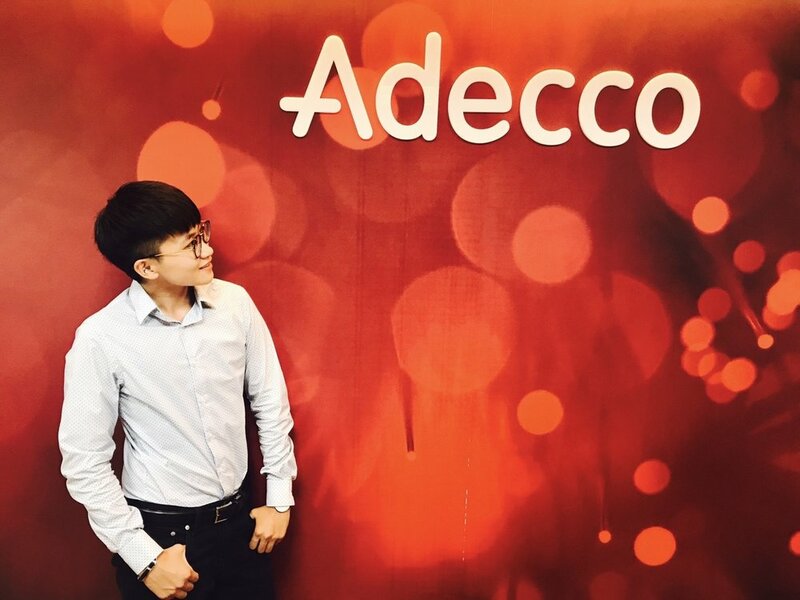 “Adecco values the potential capabilities of people rather than their appearances, sexual orientation, educational background etc.” Jamie feels satisfied but humble about her time at Adecco. The working vibes and the openness to different ideas at the company even made her want to apply for working full-time if there are chances. At Adecco, Jamie learned more than applying textbooks to practice. “I learned to open my mind to various perspectives and analyze things in a more objective way.” She said. This just "IN"! Linda Lin's new vision in India. After finishing her studies at Nottingham Trent University, Linda Lin headed to Gajra Pal & Zhu Co. located in Chennai, India for her internship opportunity. "At first, it was to meet the graduation requirements of NTU, but as I experience India, I realized it is my journey." she said. "People consider me brave coming to a country like India." Before making her trip, Linda didn't have too much impression to India, but the cultural diversity of the country made her courageous, try something else to eat when the food isn't good, solve the housing problems that the company left unsolved. "Now I make myself feel at home at a youth hostel. This can also be a way of making friends from elsewhere in the world!" There are quite a lot of differences between Taiwan and India when it comes to work. Linda serves her role as the mandarin intern in the company, making contacts to the mandarin-speaking market, translating to make sure the company stands on the same page with the client, she grasps her opportunities to know the possibilities ahead for both markets. The high uncertainty and its mysterious working culture can make people doubt India, but like the movie "Outsourced", Linda put herself into the corporate culture, visited the Taiwan Economic and Cultural Center in Chennai to know more about the market trends between Taiwan an India, and of course, got the tasks from the company done. "The Indian people believe that they can achieve more when they slow down." she observed the Indian people to have better outcomes when taking tea breaks and think what to do next. "Don't prejudge the Indian people or the country of India. Because it always surprises you, break all your prejudices." The shocking living experience in India provides Linda a new vision. She realizes that perhaps the values, policies and laws are big question marks to Taiwanese people, but as the Taiwanese government working on the new south-bound policy to cope with the rapid-growing Indian market, there is nothing to lose but to gain to make a trip to India. During the second semester at NSYSU, GHRM MBA students had the unique opportunity to gain practical work experience in the HR field through the cooperation with a local company. Each team consisted of 2-4 students and a professor as a supervisor in order to guide through this project. My team and Professor Chi (our supervisor) worked with NXP Semiconductors Taiwan which is located in the Nanzhi Export Processing Zone in Kaohsiung. NXP is a global semiconductor manufacturer which creates solutions that enable secure connections for a smarter world. NXP operates in 25 countries and employs approximately 45,000 people worldwide. At the end of 2015, NXP acquired the American company Freescale Semiconductor. The goal of the cooperation between NXP Semiconductors and GHRM students was to identify important managerial competencies in order to create a comprehensive competency model for the management team of NXP as well as to conduct a training needs analysis to develop potential training programs. After the successful completion of this project, the manager of the HRM department offered me a summer internship position. It was the first time the HRM department offered an internship position to a foreign student. I’m grateful for not only having the chance to experience student life in Taiwan, but also to gain an insight into the Taiwanese working culture. My projects included the development of a customized comprehensive competency model including hard skills and soft skills for the engineering department of NXP. In light of this, I also developed an outline of customized training programs, specifically, for the engineering department. In addition, I assisted in the creation of a new HR recruiting strategy. I was also allowed to engage in discussions and contribute to decisions via weekly HRM meetings, international conference calls, NXP training days and Town Hall meetings. During the internship I had the unique chance to observe the transition of NXP as a single company to the merger of NXP and Freescale and to see how they created a new company culture combined of Eastern and Western values that reaches consensus among all of them. This summer the American management team visited NXP in Kaohsiung to give the local management team and employees the opportunity to get informed about the new outline and goal of this merger. I was lucky to attend meetings, conferences as well as business dinners with the American HRM managers to also gain an insight into the American point of view in regards to the role of human resource management. I developed a much deeper understanding in terms of the importance of aligning the HR strategy with the overall business strategy of the company. Throughout the internship, I was happy to see how much knowledge I was able to apply from my studies at the GHRM program. In addition, I also gained new knowledge throughout the projects which will be helpful for my future studies at NSYSU as well as for my future HR career. I cheer the new GHRM MBA students to use the Independent Study project to expand their local business network and create internship opportunities. The majority of the business companies pay close attention whether the future employee candidate has gained practical work experience related to the major. Therefore, I encourage everyone to find an internship position during the next summer. Make the summer count!